Every generation thinks that it lives in either the best of times or the worst of times, and sometimes, in the words of Charles Dickens, the best of times and the worst of times together. We often pine for the simpler times and ways gone by, but we seldom realize that those days were as idyllic as we want to believe. The “good old days,” before the streets were ridden with crime and before the proliferation of serial killers and murderers appeared quite so often in the news, were better times, many will say. But the truth is, the good old days weren’t always good, and bloodthirsty killers are not a product of our modern times. This is evidenced in the story of a man named Anton Probst, who in 1866 committed a massacre that shocked the city of Philadelphia, and the entire nation, with its brutality. Anton Probst was born in Germany in 1843 and came to the United States in 1863, at the height of the Civil War. Almost immediately upon arriving in New York, the young man volunteered for service in the Union Army. He did not do so because of some patriotic zeal but rather because recruits were being paid $300 to enlist. Probst became quite good at it, in fact, and he volunteered for the army several times. He would collect a bounty for his enlistment, serve a few weeks in a training camp and then desert, moving on to another northern city, where he would enlist again for another $300. He never saw any action but he did manage to make a comfortable living during the last year or two of the war. His racket came to an end in 1865 when the war came to a close. By the fall of that year, Probst ended up penniless in Philadelphia, living on the streets. It was there that he heard of a man named Christopher Dearing who was looking for a handyman to work on his farm. Probst applied at the small homestead on the outskirts of the city, and was soon hired. The Dearing farm was only a few acres in size with a small house, a barn where a horse and one pig were kept, and some grazing space for cattle. Dearing, his wife, Julia, and their five children supported themselves by raising and selling cattle. They were not wealthy, even by the standards of the day, but they were a happy family who managed to get along well on the little they earned. Probst soon revealed his true personality. Julia Dearing noticed how he actually did little work and would lounge in the barn when he was supposed to be tending the cattle. After he made several lewd comments to her, she urged her husband to fire the strange young man after just three weeks. Dearing as his wife requested, and Probst left the farm with nowhere to go. Claiming to be in poor health, he was soon taken in by a Philadelphia charity hospital where he lingered from December 1865 to the following February. While lying on his cot in the poor house, Probst schemed to rob the Dearing’s and to get even with them. He returned to the farm on March 2, 1866 and begged Christopher Dearing to hire him back. Dearing, who felt sorry for the man, agreed. For the next month, Probst worked harder than he ever had in his life. He pretended to be quite friendly with the family, and even Julia began to feel kindly towards the young man. All the while, Probst continued to scheme and on April 7, decided to put his plan into action. That morning, Christopher Dearing traveled by buggy to the Philadelphia docks to meet a visiting family friend, Miss Elizabeth Dolan from Burlington, New Jersey. Meanwhile, Probst and Cornelius Carey, a boy who also helped on the farm, worked in a field. Events began just as it began to rain at about nine that morning. As the rain started to fall, Probst and Carey took shelter under a tree. When the boy looked away for a moment, Probst clobbered Carey with the blunt end of an ax and when he fell, stunned, Probst turned the ax over and severed the boy’s head with it. He quickly hid the body in a haystack and then lured the entire family, one by one, into the barn. There, he struck them senseless with a hammer and then chopped them with the ax until Julia and four of her children, including an infant, had been slaughtered. Only the oldest son, Willie Dearing, survived the massacre, having gone to stay with friends a few days before the crime occurred. When Mr. Dearing arrived home with Elizabeth Dolan, Probst was waiting for him. He told him that there was a sick animal in the barn, and after they went inside, Probst attacked him with the hammer and ax as well. Miss Dolan, who had gone into the house, was then lured into the barn and also was murdered. When he was finished, Probst neatly lined all of the bodies up inside of the barn and tossed hay over them. He then ransacked the farm house, looking for money. He found $10 in Dearing’s wallet, of which $4 was later found to be counterfeit, as well as a revolver and a battered old watch. He also found $3 in Miss Dolan’s purse but that was all. Probst then used Dearing’s razor to shave off his beard and changed from his blood-drenched clothing into clean clothes and boots. After that, he ate some bread and butter and then went to his room for a nap, sleeping peacefully, unconcerned about the murders. Before he took leave of the farm, he took the time to feed the dogs and chickens, and then put out feed for the horses and the cow in the barn, just steps away from where the bodies of the Dearing family lay stiffening under the hay. After feeding the animals, Dearing leisurely strolled away and spent the next few days on the streets. Neighbors came to the farm on the day after the murders and found the bodies of the family in the barn. They notified the police, who had little trouble tracking down Probst. He had sold Dearing’s revolver to a bartender and his watch to a jeweler. 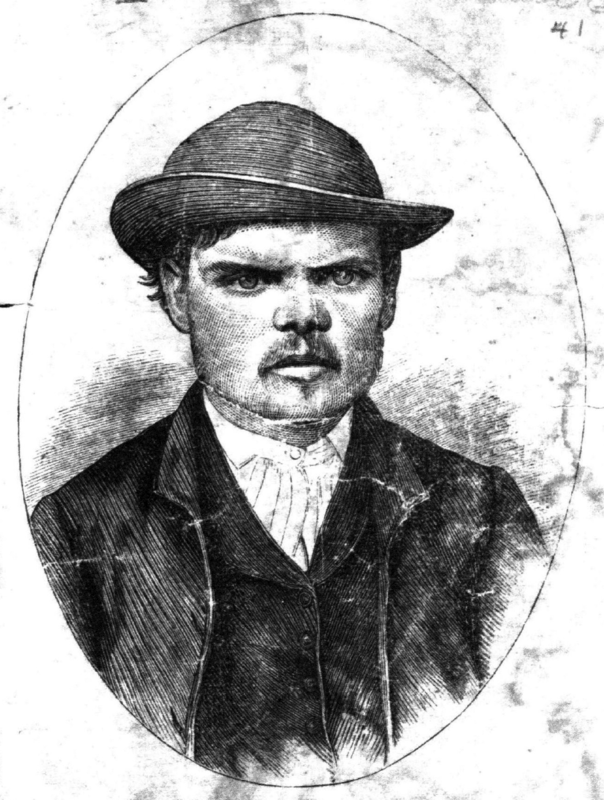 On April 12, five days after Philadelphia’s first mass murder, he was arrested by a single policeman while drinking in a tavern at 23rd and Market Streets. He surrendered without incident. At first, the killer protested his innocence but the evidence against him was so strong that by the end of his trial on May 1, the jury took only 20 minutes to find him guilty. He then confessed to the crimes, and was executed on June 8. Strangely, even after death, Anton Probst has remained in Philadelphia. Following his execution, his body was delivered to the medical college, where it was dissected. His mounted skeleton then went on display in the museum of the medical college there, which still operates today. It was a strange and macabre, although perhaps fitting, ending for this vicious killer.